This polish caught my attention when I first saw it. I know the colors are kind of Halloween-y, but looking at it, it definitely reminded me of a Monarch butterfly's color scheme. This is Crowstoes: Shoot the Butterfly. 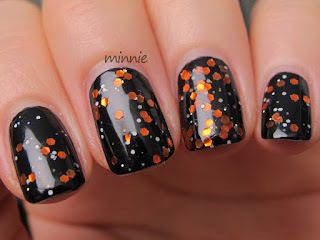 It's a black jelly with copper hexes, small white glitters and holo microglitters. I did one coat over a base coat of black polish with 2 coats on my ring finger. The glitter is definitely not hard to get out of the bottle. I liked the sparse look better, hence layering one layer over black for the majority of my fingers. I find it whimsical, despite it being black based, haha. 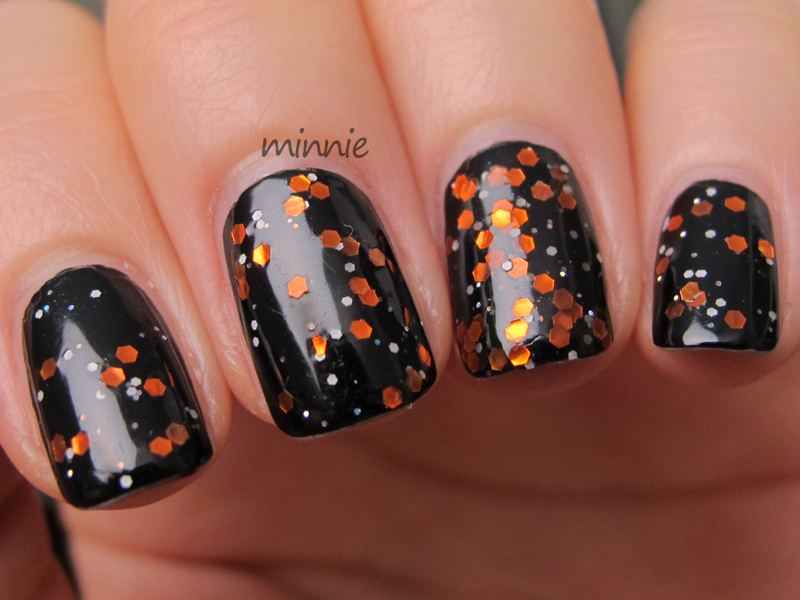 The sparkle that the holo microglitter adds really adds depth, along with the base being black so the white glitters are at different depths. Do you like the look of one layer or two? I'd probably do two coats, but that's just because I'm a glitter fiend ;) I adore this polish, it's been on my wishlist for ages! This is so pretty! It really does remind me of a butterfly.